Asparagus comes in many shapes, and can really uplift a floral design by its delicate appearance and texture! They all have fresh-looking green leaves, but the leaf shape and branch shape differ. Whether you are looking for a sturdy texture-bringer or a delicate touch of softness: the Asparagus family can fill your green needs! Learn all about the Asparagus varieties that Holex offers in this blog post! Asparagus Falcatus is grown in Holland and has slim, long leaves which are placed closely to the side stem. The main stem has little, prickly spines at the beginning of each side stem. It looks a bit like Eucalyptus Nicholii, but this Asparagus variety has a fresh, deep green color. In the Holex webshop we offer them in various stem lengths, from 45 cm to 65 cm. Asparagus Umbellatus can be described best as a “spray” Asparagus. The stems are delicate, and there are many side stems per branch. The leaves are also delicate (but they feel firm! ), multiple needle-shaped (but soft) leaves grow together in a bulb shape, spread on each side stem. Umbellatus comes from Holland, Israel, and the US. 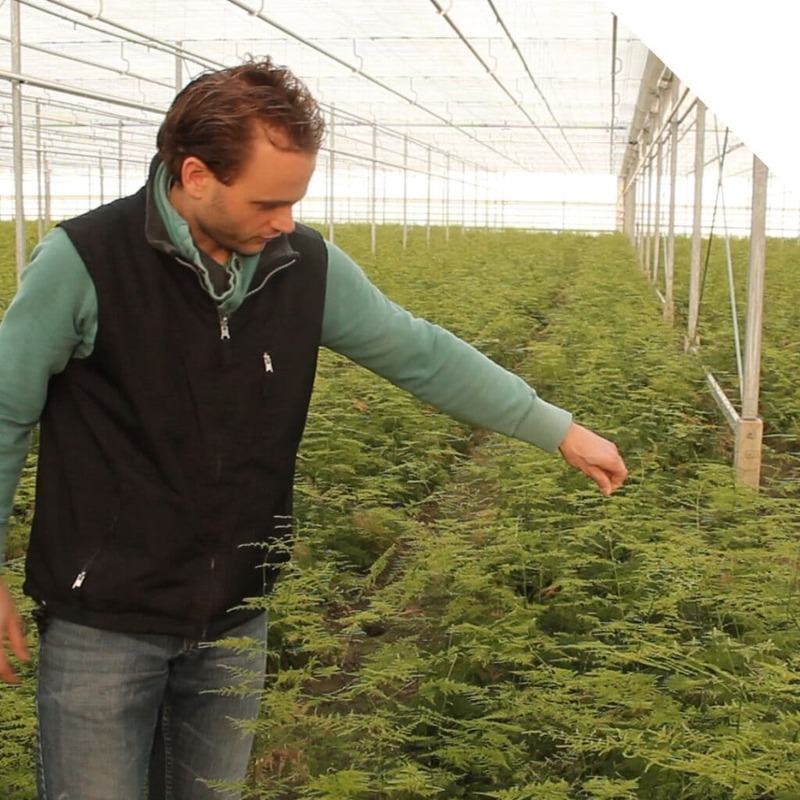 Holex offers this Asparagus variety in lengths from 40 to 60 cm. Contact us if you need other lengths! Asparagus Densiflorus, also known as Foxtail Fern (although it is not a Fern variety! ), is grown in Holland and comes in three varieties: Sprengeri, Cwebe, and Myers. Although they look alike due to the leaf shape and texture, they also differ from each other. 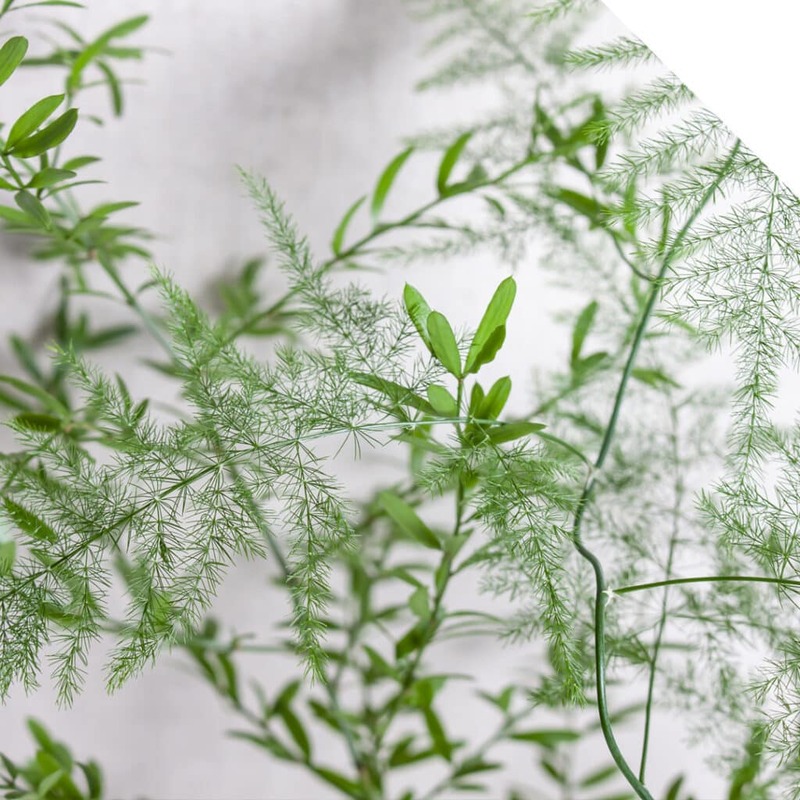 They all have delicate, 1 to 2 cm oval shaped leaves. Asparagus Dens. Sprengeri – Sprengeri has side stems, which are growing upwards. At the beginning of each side stem, you will find a little, prickly spine. The little leaves grow all around the side stems. Asparagus Dens. Cwebe – Cwebe also has side stems, which are turned outwards. The leaves grow on both sides and face upwards. Compared to Sprengeri, whose leaves are grouped together, Cwebe’s leaves are slightly bigger and they grow evenly spread along each side stem, which don’t carry thorns. Asparagus Dens. Myers – Myers has no side stems. The leaves are growing on the main stems, and are facing up- and outwards. Together they form a large cone shape. Holex offers the three Densiflorus varieties year-round in various lengths: Cwebe in 40, 50 and 65 cm, Myers in 40, 50 en 60 cm, and Sprengeri in 45, 65 and 85 cm. 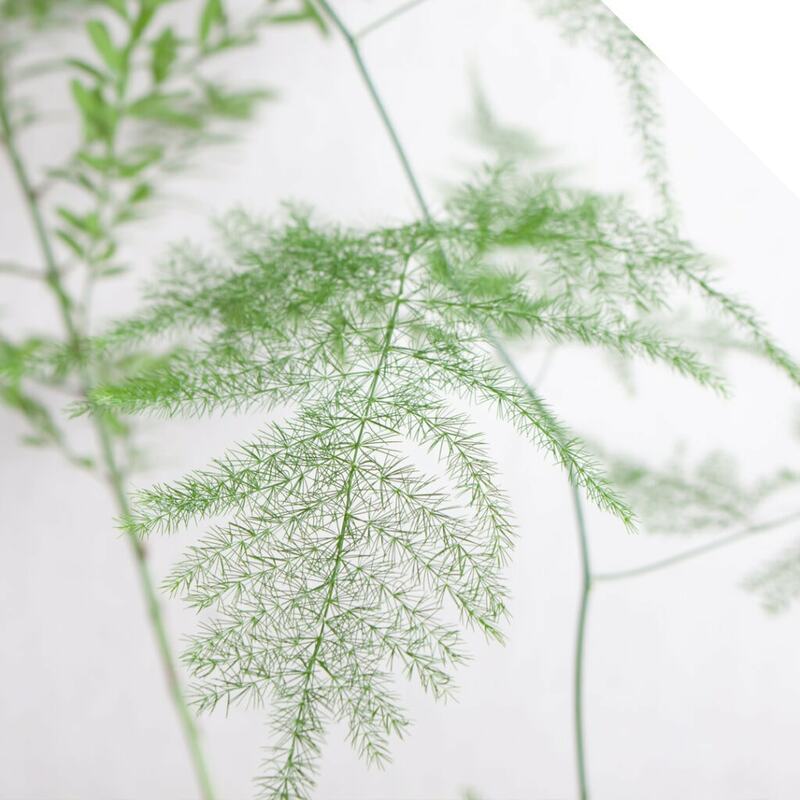 Setaceus, also known as Lace Fern, or, Ferny Asparagus, has a high decorative value. It almost has a bit of an alien appearance: how can there be leaves so delicate?? This variety originally comes from Southern Africa. Setaceus has side stems which are growning outwards in a 90 degree angle from the main stem. Each side stem grow on a 3 to 4 cm distance from one another. On a side stem there are smaller side stems, which form a fern shape. The leaves on these side stems are all growing outwards and look like hair, they are very delicate. Holex offers Setaceus in different grades: 1st Feathers, these – hence the name – are the tops of the stems. The feathery side stems are on top of the stem. 1st Feathers is available in 45 cm. Extra Feathers do also have the side stems on top on the stem, the difference to 1st Feathers is that the have more side stems and a longer stem. Extra Feathers is available in 65 cm . And, last, but not least: we offer Medium Topped and Long Topped. With these varieties, the grower cuts off the top of the stems already in the greenhouse. In this way, the plant sends its energy to its side stems instead of to the top. The side stems get bigger and each branch is more voluminous. We offer Medium Topped in 50 cm and Long Topped in 85 cm. Painted Setaceus: A Real Eye-Cathcer for The Holiday Season! Especially during the holiday winter season, painted Setaceus is very popular. This Asparagus variety holds perfectly with an extra layer of paint, and still has a great vase life. You can order them in a wide palette of colors, and also beautiful metallics, like, gold, champagne, and silver. Check the webshop or contact your Account Manager for availability. Together with Setaceus, Treefern is the softest looking and feeling Asparagus available. When you see it, you must touch it! Treefern has many side stems and they all grown upwards. On each side stem more side stems appear, and the tiny needle shaped leaves, which are spread al along the stem, face the same direction: out- and upwards. We offer Treefern Asparagus in various lengths. Asparagus is native to the Eastern Cape, South Africa. Its name comes from the Greek word “Asparagos”, like the tasty, edible asparagus we all know. The name is possibly acquired from “a”, which means “intensive”, and “sparassa”, which means “to tear”. This can refer to the sharp spines that some Asparagus varieties carry. Another explanation is that it refers to the Greek word “spargan”, which means “to sprout”, because the plant’s root tubers look fibrous and ready to resprout. Asparagus isn’t well-known to be used for its symbolism; yet we think, regarding the returning nickname “Fern”, it symbolizes decorum, spirit, and uniqueness of character. Add a touch of romance to a bohemian chic wedding bouquet with Asparagus Setaceus mixed with pastel-colored Spray Rose Mikado, Peony Duchesse de Nemours, and Lisianthus Alissa Light Apricot. 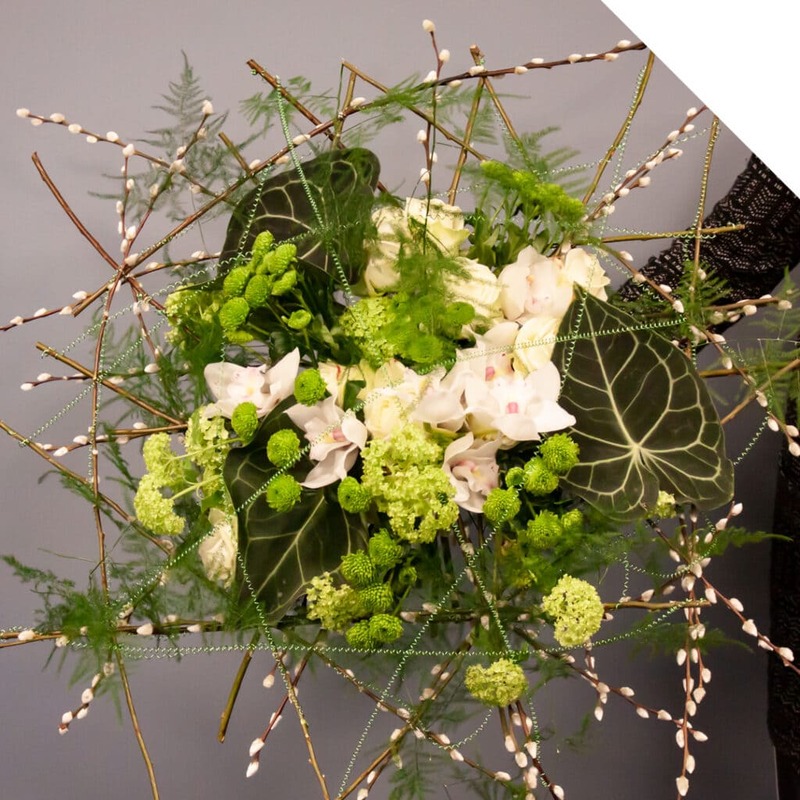 Compose a Father’s Day bouquet with the sturdy looking Asparagus Falcatus mixed with Eryngium Supernova, Delphinium Dewi Blue Star, and Monkshood. For a modern and stylish centerpiece with different kinds of textures you can use Asparagus Densiflorus Myers mixed with Craspedia Globlosa, Hydrangea Bela Blue, and Calla Goldcup. When you receive your Asparagus, cut the stems and put them in fresh, clean water with flower food immediately. 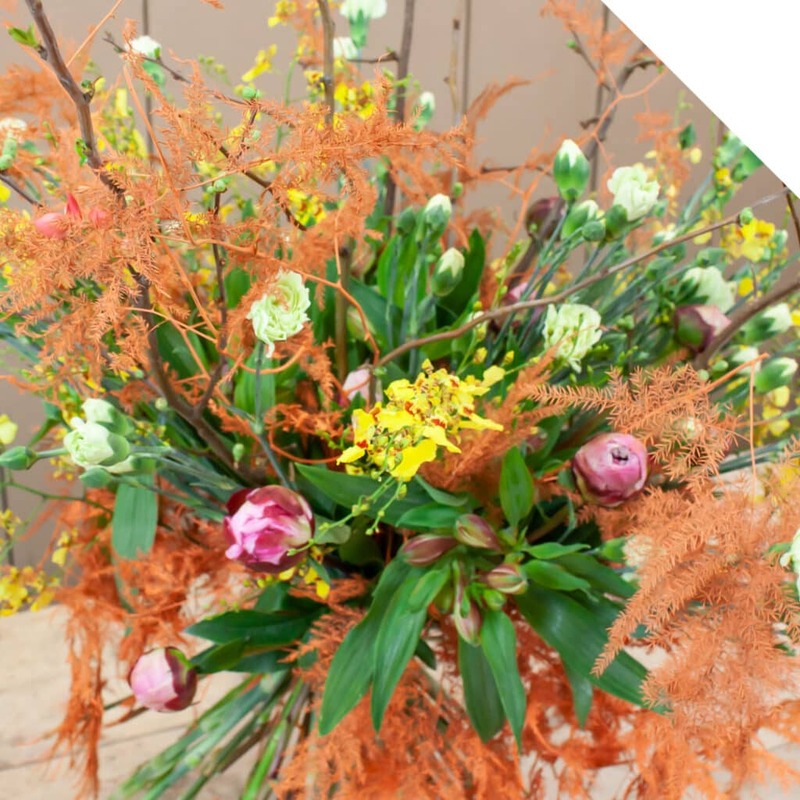 The sooner the stems are hydrated, the better the vase life: without water the branches will shed and the product quality will decline rapidly.